Garden of Aaron: Lovely Lavender is a Bee Magnet! 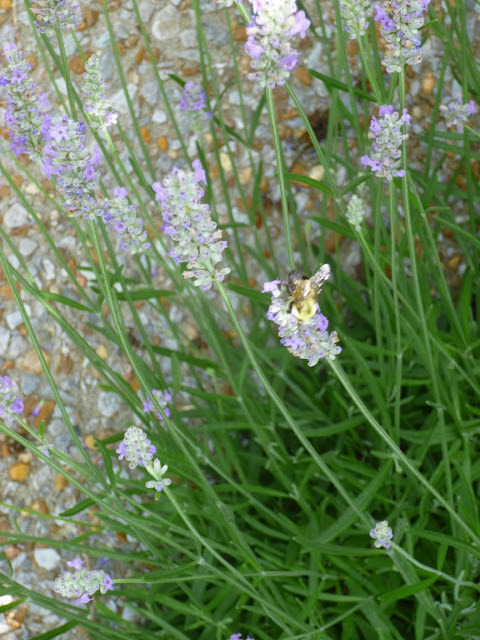 Lovely Lavender is a Bee Magnet! One of my favorite plants in the June garden this year, 'Hidcote' English lavender seems to be thriving in its second year in the garden. 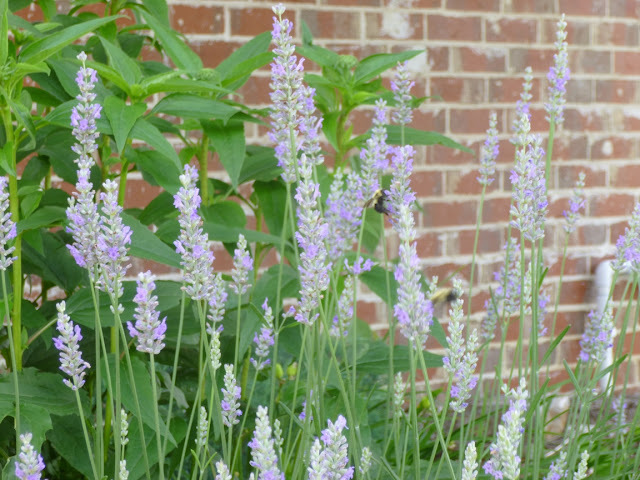 I picked 'Hidcote' because it is supposed to have some of the greatest cold tolerance of any lavender. It was basically evergreen last winter, although there was a bit of foliar discoloration (purpling) and wilting toward the end of the winter. I followed the pruning instructions kindly provided in this excellent YouTube video by Sarah Bader from Lavender at Stonegate, which seems to have promoted a nice dense habit on the plant. I plan to do another major pruning this year right after the lavender has finished blooming in order to promote dense regrowth for next year. As regular readers of the blog know, I have pretty heavy clay soil and I rarely do serious amending, so I was worried as to whether lavender could survive here. 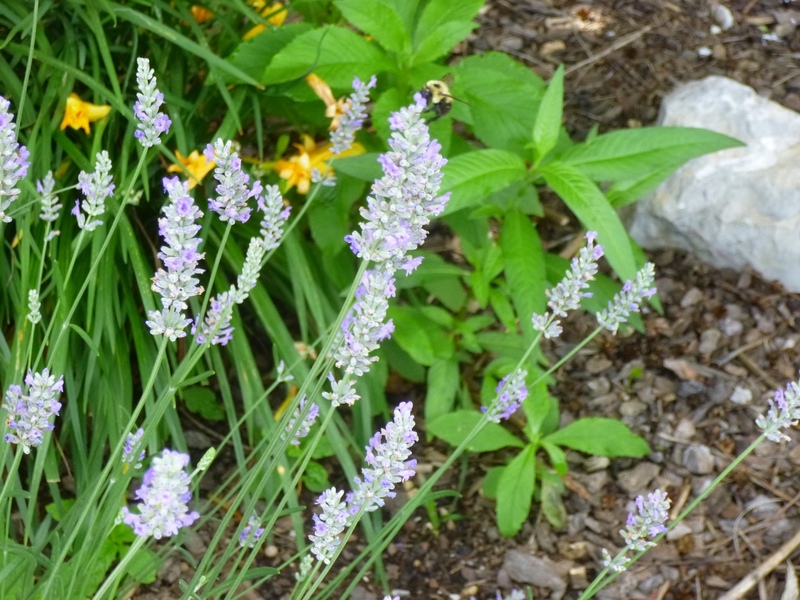 For instance, one Dave's Garden reviewer from Idaho who praised the plant said that lavenders require "hot, dry, rocky, sandy soil" and another in Kentucky described growing lavender on "sandy, lean and very well-drained soil with pea gravel on top." Well, I didn't do any of that. I just plopped three lavender plants into my regular clay soil, that I may have amended (can't recall) with some soil conditioner. So far, they all seem to be fine, having survived an unusually cold winter and a very wet spring. 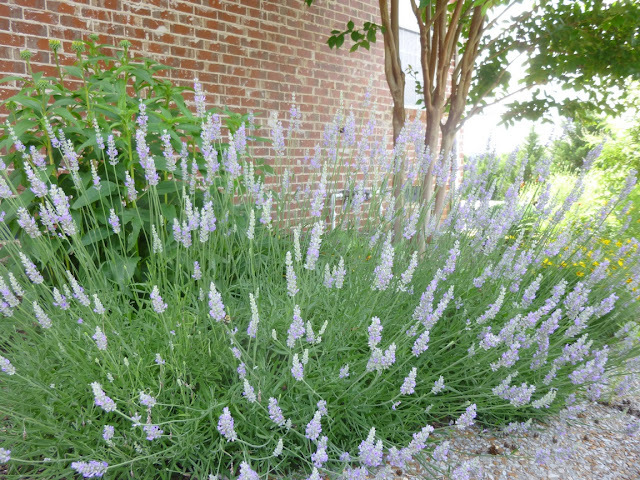 Oh and despite the fact that NCSU says they "require" perfectly well-drained soil and full sun, my lavender plants are also getting a considerable amount of shade (morning shade from the shadow of the house, afternoon shade from a couple of big crape myrtles). I'm not saying any of this to brag. For all I know, my lavenders are at Death's door and just putting on a brave show of it. But for now, they seem to be thriving, despite the fact that I've placed them in less-than-ideal circumstances. I'm sharing this fact so you all can know that if I haven't killed lavender (yet) then it may be tougher and more versatile than some books and other gardening sources suggest. OSU hints at this adaptability, indicating that L. angustifolia may actually be able to tolerate partial sun, as well as "various soils and soil pHs." One of my favorite things about lavender is just how popular it is with bees - especially bumblebees. All day long and well into evening, I usually can count on spying around 6 to 8 bees busily harvesting nectar and pollen from the flowers. A study at the University of Sussex confirmed that bees are highly attracted to lavender flowers. PS - If anyone has advice on harvesting lavender for use in potpourris or cooking, I'm all ears! Hail to the (Snow) Queen!